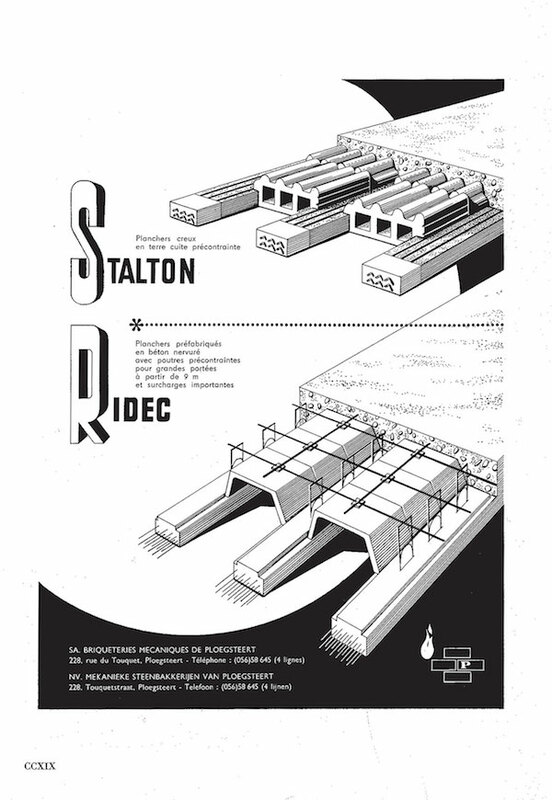 The beam-and-block system Stalhton was developed in Switzerland. The catalogue of the building materials trader Victor Trief included hollow core slabs in different sizes. Foundation of Echo: a building company and manufacturer of hollow core slabs. The General Specifications for private buildings identified five categories of floors with precast elements. A table with producers of precast elements in lightweight concrete in Belgium included 15 manufacturers of prefabricated floors made of lightweight concrete. Febe edited a brochure on the standardization of precast concrete elements for buildings. Floors and floor slabs in post-war housing were commonly constructed with wood, concrete, and/or ceramics. While timber floor joists were very popular in the early 20th century, they were increasingly supplanted in the latter 20th century by reinforced concrete floors. To avoid the difficult and costly construction of formwork required to make cast in situ concrete floors, floors constructed with prefabricated elements gained ground, especially in the post-war period. Numerous construction companies developed such floor systems, which included hollow core slabs and beam-and-block floor systems, or systems that combined prefab and cast in situ elements. The materials they used varied, from lightweight concrete, reinforced concrete, pre-stressed concrete, and ceramics, to combinations of these. Furthermore, systems focused on different aspects of prefabrication and their implementation in the construction yard, leading to a broad range of possible benefits and fields of application. In general, the ease with which floors could be constructed, the adequate loadbearing capacity (typically aiming at 200 to 300 kg/m², which was a common service load in house building), the thermal insulating properties, and low weight, were decisive factors in their emergence. Prefab floor systems had already been introduced before the Second World War. These varied from beam-and-block systems, hollow core slabs (with typically only one hollow core, as opposed to the post-war counterparts with several adjacent hollow cores inside), and prefabricated slabs made with hollow bricks. Each system claimed to be cheaper, and quicker and easier to build than the rest. Yet hardly any of these systems lasted for more than a few years, or else disappeared after the Second World War. During the post-World War II period, important changes occurred in production methods, building materials, output, and technical equipment, both in the factory and at the construction site. Manufacturers of the two main prefab floor systems, beam-and-block and hollow core slabs, responded differently to changes in the building industry. The beam-and-block floor systems, that were often patented, remained ‘systems’, meaning a fixed set of elements to combine in a typical configuration, with specific characteristics and dimensions. The components were hardly ever to be used for other purposes or in combination with other brands or products. Hollow core slabs on the other hand were more generic construction elements, not (always) linked to a specific system. Connecting these slabs with other elements or parts of the building was usually done by means of a joint or screed floor in concrete or mortar. As the systems and brands of prefabricated floor elements proliferated in the post-war period, so did the need for guidelines and comprehensive overviews. In 1970, the General Specifications for the execution of private buildings were issued (by the Royal Federation of Architects’ Associations in Belgium FAB, the National Confederation of the Building Industry NCB and the Belgian Building Research Institute BBRI). Chapter 7 of these technical prescriptions was devoted to loadbearing floors, and it covered ‘prefabricated elements in baked clay and concrete’. Such elements included on the one hand beams or slabs, which contributed to or completely accounted for the loadbearing capacity of the floor, and on the other hand blocks (interlocking blocks or simple filling blocks), which may or may not contribute to the loadbearing capacity of the floor. All the elements were usually monolithically connected with reinforced concrete or mortar, in the joints between the elements and possibly with an extra compression layer or screed floor. The specifications identified five categories of floors with prefabricated elements, classified according to the types of elements used and how they were combined. The same five categories were also used by the Belgian Institute for Normalization (BIN), and in the Agenda du Batiment (Nachtergal, 1977). The first category, ‘adjacent beams or slabs’, included the typical hollow core slabs: prefabricated beams or slabs were put next to each other, and the relatively small joints between them were filled with mortar or reinforced concrete. The second category were ‘beam-and-block’ systems. This type combined prefabricated beams with a broadened bottom flange, on which the prefabricated blocks could rest. The difference between it and the third category, ‘beam-and-filling-blocks’, was that in the latter, the profiles of the beams and filling blocks were not adjusted to each other, as they did not touch each other. In both systems, the joints were filled with mortar or (reinforced) concrete and could be finished with a layer of in situ (reinforced) concrete or mortar. The fourth and fifth categories both had cast in situ beams and prefabricated blocks. In the fourth category, ‘in-situ-beams-and-precast-blocks’, the beams were cast first and the blocks with a matching cross section were put in afterwards, and the joints were filled with mortar. In the fifth category, ‘ribbed-floor-with-filling-blocks’, the filling blocks were put in first, next to each other, as permanent formwork. The bottom flange of the filling blocks was broader, so that grooves were created. When reinforcing bars or pre-stressing wires were put in place and these grooves were filled with concrete, and the top surface of the blocks was covered with a layer of concrete, an in situ ribbed floor was created. This differed from regular ribbed floors by having flat bottom and top surfaces. This classification only took into account the structural concept and basic form of the elements, not the materials used. In fact, all the elements in each category (except for the cast in situ elements) could be constructed in ceramics, concrete (regular, reinforced, or pre-stressed), and lightweight concrete, as well as combinations of them. All five categories of floor systems had to meet the same performance standards, for instance in relation to bending: the maximum deflection had to be smaller or equal to 1/750 of the span, while the permanent deflection could not exceed 1/2000 of the span. The average compressive strength of the beams and slabs could not be less than 29.42 N/mm². For blocks and filling blocks that did not add to the loadbearing capacity, this was only 3.92 N/mm². For autoclaved gas concrete, the maximum weight was 750 kg/m³ and the minimum compressive strength had to be between 2.45 and 4.90 N/mm², depending on the type of elements that were used. Regarding the concrete cover of the reinforcement, the minimum cover was set at 15 mm, while 12.5 mm was enough in autoclaved cellular concrete. With respect to the execution or installation of floors in the five categories, those in the third and fourth categories had a major drawback: they required elaborate shuttering and formwork. This annulled one of the important benefits claimed for prefab floor systems – easy and rapid installation. Consequently, these two systems were far less popular than hollow core slabs, beam-and-block systems, and ribbed floors with filling blocks. In addition, the latter was not commonly used in housing, because such ribbed floors were usually built as part of cast in situ concrete structures and were typically used for large spans and floors spanning in two directions (e.g. in offices, schools, and public buildings, instead of houses). Prefabricated hollow core slabs were usually precast in reinforced or pre-stressed concrete. They often had a rectangular or trapezoidal cross section, and continuous, longitudinal cavities. While the top and bottom of the slab had a structural and practical function, the inner mass could be hollowed without any loss of function, yet this reduced the slab’s weight substantially. The hollow cores could be created in different ways, for example, by using metal moulds that were retracted after hardening, or by extrusion (without internal formwork) if a very dry concrete mixture was used. The long edges of the slabs were often chamfered to allow a reinforcement bar to be inserted in the joint. Hollow core slabs were made in different sizes, ranging from 25 cm to 160 cm wide (commonly between 40 and 60 cm), and usually up to 4 m or even 8 m in length. This became a very popular building product, and consequently several manufacturers produced hollow core slabs for the Belgian market. Some of these companies were construction companies that used their own hollow core slabs in construction works, while others were mainly manufacturers of building materials. During the 1950s and 1960s, in an effort to stand out in this abundance, many manufacturers focused on particular characteristics, e.g. producing elements with shorter lengths or smaller weights (both to ease the installation) or using specific types of concrete for higher loadbearing or thermal insulating capacities. 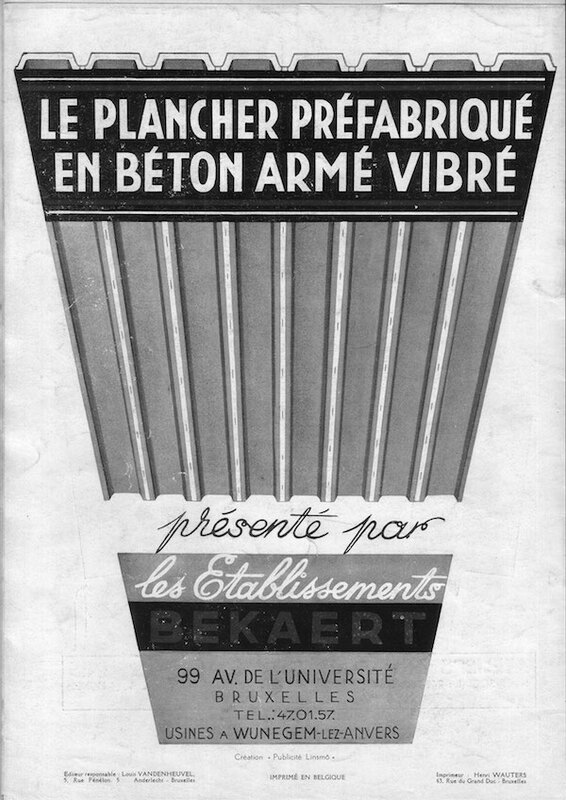 In the 1970s, attempting to normalize and standardize the prefabricated floor systems that had proliferated since the end of the Second World War, the Federation of the Precast Concrete Industry in Belgium (Febe, the successor of the Union for Agglomerates with Cement of Belgium UACB) edited a brochure on the standardization of precast concrete elements for buildings. One of the things put forward in the brochure was a standard width of 60 cm or 1.20 m for hollow core slabs. The preferred thickness was between 15 and 40 cm, with regular intervals of 5 cm. To enhance the appeal for their products for certain applications, manufacturers reduced the weight and improved the thermal capacity of their hollow core slabs. Several manufacturers used particular types of concrete, for instance concrete with pumice or other lightweight aggregates. Pumecrete was used by Bims d’Origine in rather typical hollow core slabs. The Dutch company Schokbeton and Westvlaamsche Betonwerkerij were more creative. Schokbeton, for instance, produced three types of hollow core slabs in pumecrete: regular hollow core slabs, a cassette floor, and a type that combined these two types. The cassette floors had large, square hollows or alcoves on the bottom side. They were lightweight, while the longitudinal and transverse ribs of the cassettes provided loadbearing strength and ensured the rigidity of the slabs. Although its thermal insulation capacity was slightly lower than that of hollow core slabs, these floors generally weighed less. Schokbeton also combined the two concepts in a slab having both a series of continuous, longitudinal cavities at the top and shallower square alcoves at the bottom. All three types were 50 cm wide with a maximum length of 3.70 m, and had a tongue and groove joint at the side. Depending on the expected loads (between 200 and 500 kg/m²), the slabs were 7 to 13 cm thick. Westvlaamsche Betonwerkerij also used pumice concrete for their hollow floors Solidus, yet in a very particular way. They created a hollow element in lightweight pumecrete (between 900 and 1000 kg/m³), which was shaped like a circle segment with a central stiffening rib. The top of this hollow element was covered with a heavier type of pumecrete (up to 1300 kg/m³), including reinforcement, to form a rectangular shaped slab. The edges had indentations to improve adherence of the joint mortar. Because of the combination of hollow cores and lightweight aggregates, these slabs weighed up to 60% less than solid concrete floors. The Belgian company Echo (founded in 1950 by Eduard Cuyvers in Houthalen, hence the acronym ECHO) used washed and calibrated schist as aggregate to reduce the weight of their precast concrete products. They produced hollow core slabs up to 4.50 m long, which were ideally suited for houses and apartments. As the company and the technology evolved during the 1960s and 1970s, Echo expanded its product range with hollow core slabs made of reinforced and pre-stressed concrete. 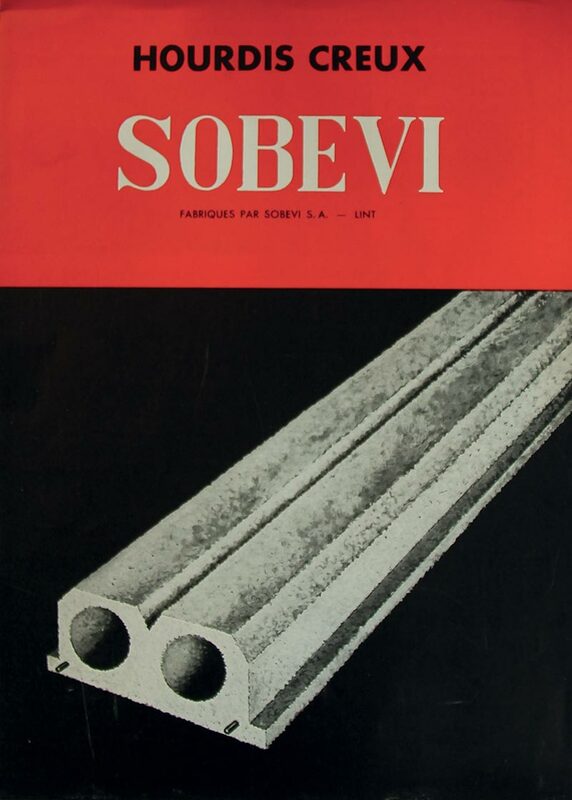 Another manufacturer in this category is the Belgian company Isobeton, which produced blocks, slabs, and entire houses in ‘insulating concrete’ (the exact composition of which was not published though). The Isobeton precast slabs were 40 cm wide, 12 cm high, and up to 4 m long. They weighed 50 kg/m², could carry 250 kg/m², and had a λ-value of 0.87 W/mK. Another way in which the range of hollow core products was diversified, was by producing short elements, which were easier to transport and to install. An example of these was the hollow core slab Ultra produced by Gelderbeton. Similar to standard hollow core slabs, Ultra had longitudinal reinforcement and stirrups in the joints, and a compression layer with transverse reinforcement on top. But unlike standard slabs, these reached only half-way across a span. To connect the half-way slabs, a 10 cm transverse rib was cast in situ, requiring temporary struts and formwork. A maximum total span of 8 m could be achieved. 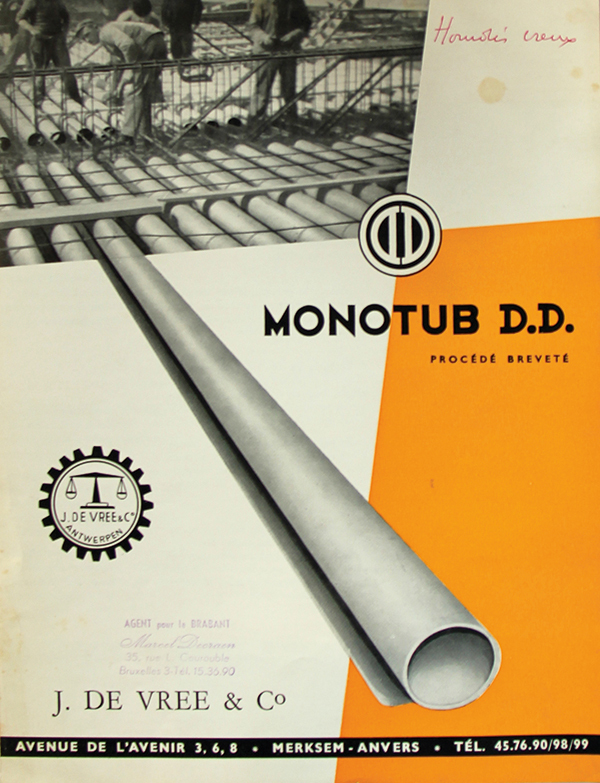 Another manufacturer of shorter elements was the Belgian company Novobric. They designed several floor systems, for instance the hollow floor slabs Excelsior: these 25 cm-wide slabs were very short (between 1 and 1.6 m) and thin (4 or 6 cm high), and did not need to be covered with concrete. Because of the small dimensions and limited loadbearing capacity, these slabs or panels were suited for short spans or to cover roofs. The loadbearing capacity of hollow core slabs could be increased by using specific compositions of reinforced concrete, special configurations of the reinforcement, or pre-stressed concrete. 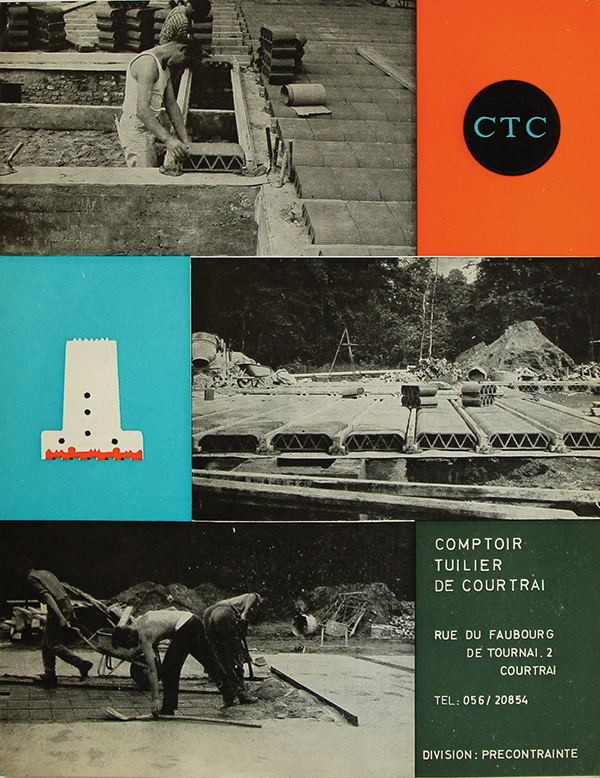 The company Matériaux et Techniques Modernes M.T.M., with a factory in Machelen, produced three different types of self-supporting hollow core slabs in vibrated concrete (P1, P2, and P3). All three looked the same on the outside and had three circular, longitudinal cavities inside. Yet by varying the exact composition of the concrete (e.g. changing the cement quantity), the three types could support different maximum loads (up to 500 kg/m²) and achieve spans up to 4.80 m. In addition, M.T.M. produced a hollow core slab named ‘N’: this had a different edge profile so that less concrete or mortar was needed to fill the joints. An example of a hollow core slab with specific reinforcement was Ultra by Vibrabeton. It was reinforced in two directions: longitudinal reinforcement at the bottom of the slab and transverse reinforcement at the top of the slab. The transverse reinforcement protruded approximately 40 cm so that the bars could be connected and form a continuous reinforcement. The Ultra slabs came in three types: 11 cm high (30 cm to 3.80 m long, weighing 75 kg/m²), 15 cm high (30 cm to 3 m long, weighing 105 kg/m²), and 20 cm high (30 cm to 2.60 m long, weighing 125 kg/m²). Probably the most efficient way to enhance loadbearing capacities of these elements was to make them with pre-stressed concrete. One of the major Belgian manufacturers of precast and pre-stressed concrete products was Ergon in Lier. Ergon was founded in 1963 as a subdivision of the cement manufacturer CBR (Cimenteries et Briqueteries Réunies) for precast cement and concrete products. Ergon mass produced beams, columns, panels, TT-floor slabs, and hollow core slabs, made of reinforced concrete and pre-stressed concrete. Compared to the hollow core slabs in reinforced concrete, which were 60 cm wide and up to 6m long, the pre-stressed concrete floor slabs usually were wider and longer. An example of the latter is the Ergon SP-floor slab. Both the top and the bottom surfaces of the 1.20 m wide floor slab were flat, and it had circular cavities running through its length. The thickness of the slab (20, 27, or 32 cm), and the number of pre-stressing cables, were determined by the desired loadbearing capacity. The slabs were made by means of an extrusion process; after the concrete had set, the 80 m long slab (including the pre-stressing wires) was cut into the desired lengths. Spans could vary from 6 to 14.5 m, and support a service load range of 2000 to 250 kg/m², respectively. The SP-floor slabs were mainly used for spans between 6 and 9 m.
While most of the hollow core slabs had a more or less typical cross section (rectangular or chamfered, with a number of circular cavities inside), several companies developed hollow core slabs with special profiles. These included the Record slabs, manufactured by the company Briqueteries du Brabant, and the Zig-Zag slabs, manufactured by Scheerders van Kerchove (SVK). Another example of a hollow core slab with an intricate cross section was Atlas developed by Novobric. These elements were light and easy to handle, and had good insulation properties (λ-value of 0.145 W/mK). They consisted of short elements in ceramics that were connected lengthwise to create slabs, by means of reinforced concrete inserted in three small grooves at the cop of the ceramic elements. These slabs, which could be cast in situ or in the factory, were then put next to each other and the joints between them were filled with concrete. The maximum length of the Atlas slabs was 8 m (under a load of 250 kg/m²). Individual ceramic blocks had widths of between 25 or 33 cm, and heights of between 8.5 cm and 20.5 cm. An optional compression layer added 3 cm to the total height. 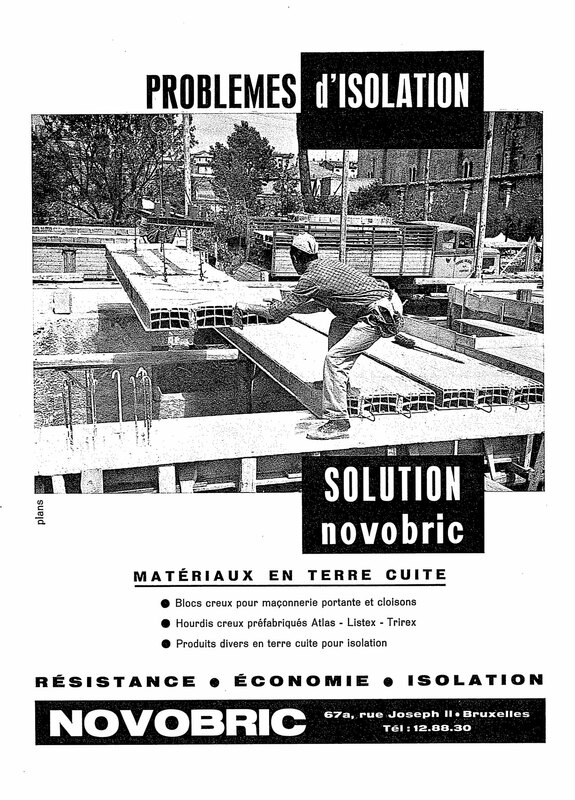 Novobric used the same elements to produce wide, prefabricated slabs, delivered on site with a maximum length of 6.85 m.
Similar to the already mentioned cassette floor slabs by Schokbeton, were the cassette floor slabs made by Duyck in vibrated reinforced concrete. The patented profile of the slab, shaped like an inverted U, reduced the dead weight without comprising the slab’s rigidity. As they were ‘open’ at their extremities, Duyck provided special filler pieces to prevent concrete cast in situ at the supports from leaking. The slabs came in different forms and dimensions. The standard types 1 to 7 were either 14 or 17 cm thick, 40 cm wide, and spanned up to 5 or 6 m. The sides of the slabs were either chamfered or rectangular, and they weighed 125 or 155 kg/m². For long spans or heavy loads, the slabs could be combined with prefabricated, reinforced concrete ribs placed in the joint between two slabs (types 1R to 7R). This system eliminated wet mortar and in situ concrete, and resulted in an important savings in time and finishing cost, as the floor could be used immediately after installation. If necessary, a compression layer could be applied. The maximum spans were determined according to loads: for example, for type 7(R), the maximum span that could safely support 350 kg/m² was 6.40 m; this span dropped to 3.50 m for a load of up to 1000 kg/m². Duyck also produced types T1 and T2 (both with or without a precast rib). These were smaller than the standard slabs: they were only 12 cm thick, and intended for smaller spans (up to 5 m) and loads of 250 to 300 kg/m². T1 and T2 looked and weighed the same (115 kg/m²), but the extra reinforcement added to the latter, allowed a higher load. Another particular type of hollow core slab was B.A.S.C., which stands for ‘Béton Armé Sans Coffrage’ (reinforced concrete without formwork). These were beams with a cross section shaped like a circle segment; in situ concrete was cast between them to create floors. The beams were hollow (except on their extremities), with two thickened corners at the bottom where a reinforcement bar was incorporated. The B.A.S.C. floor was developed in the interwar period and continued to evolve during the post-war period: in the 1950s, the type B.A.S.C. Minor was added to the existing Standard and Major types. The three types were based on the same concept, yet had different dimensions and performance measures. The smallest beams, type Minor, were 12 cm high, 33 cm wide, and up to 5 m long; they weighed 81 kg/m², without the filling concrete. Spanning 3.75 m, they could carry a load of 200 kg/m²; if the span was increased to 5 m, the load decreased to 150 kg/m². The Standard beam was 16 cm high, also 33 cm wide, and up to 6.50 m long, and weighed 90 kg/m². With a load of 350 kg/m², the maximum span was 4.50 m. The Major beams were 26 cm high, 40 cm wide, and 2.50 m long, and weighed 115 kg/m². These were always executed with a layer of reinforced concrete on top (while this was optional in the two other types), to carry maximum loads from 500 to 2000 kg/m², with spans over 6.5m. The bottom of the B.A.S.C. floor was usually rough, so it could be plastered directly. The B.A.S.C. floors were advertised as being easy and quick to construct, economical, lightweight, fire resistant, acoustically insulating, insensible to chemical agents, rigid, and monolithic. Given the structural and formal design of the beams, the two latter properties demand a critical look. If the floor was not finished with a reinforced compression layer on top, the claim that it was monolithic is questionable. Secondly, the precast beams were very slender elements: the smallest beams were only 12 mm thick at the bottom and 22 mm at the somewhat thickened top, which raises questions about the loadbearing resistance of the beams, as well as the concrete cover of the reinforcements. Nevertheless, the B.A.S.C. floors were used on a relatively large scale: a 1950s commercial brochure mentions that over 80.000 m² of B.A.S.C. floors had been installed in apartment buildings, mostly in Brussels. Monotub D.D. is another product that can be mentioned in the category of hollow core slabs. Monotub D.D. were hollow tubes made of waterproof cardboard which were used as internal, permanent formwork for hollow core slabs. The tubes were used to produce precast slabs and also on site, to make customized hollow floor slabs. Light and cheap, yet strong and moisture resistant, the tubes came in various diameters, from 5 to 50 cm, and were cut to the desired length at the factory or on site. During production, the tubes were held in place by connecting them to the reinforcements. The tubes increased a floor’s thermal capacity (up to 40%) and reduced its weight: depending on the thickness of the floor and the diameter of the tubes, the Monotub floor weighed 30 to 45% less than a solid concrete slab. For a floor of 15 cm, for example, this meant 125 kg/m² less dead weight. Companies also reduced the weight of floors by making (solid) slabs with lightweight concrete. 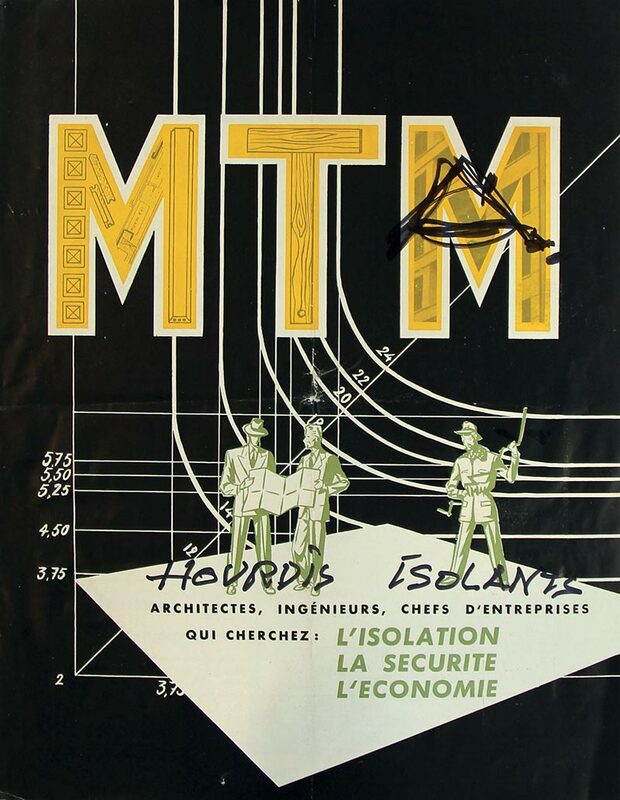 Matériaux et Techniques Modernes M.T.M. and Westvlaamsche Betonwerkerij produced both hollow core slabs and lightweight-concrete solid slabs. These solid slabs had relatively low maximum spans and loadbearing capacities (spans from 1 to 3 m and loads from 150 to 200 kg/m²): they were intended to be used mainly as roof decks or roof linings. 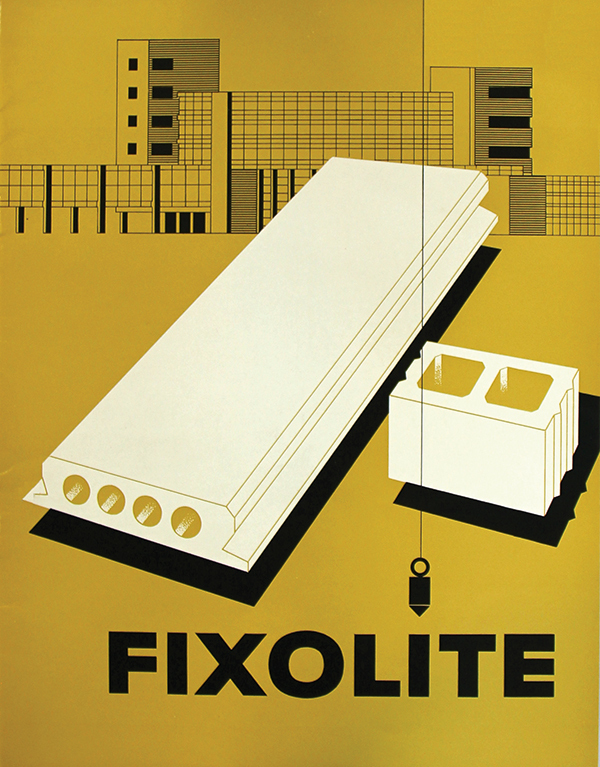 Also, the Belgian company Fixolite produced self-supporting, reinforced solid slabs in lightweight concrete, to be used for roofs. These slabs were 6 to 16 cm thick, 50 cm wide, and 1.10 to 4.5 m long, and supported a load of 150 kg/m². The concrete used by Fixolite was based on mineralized wood fibers, mixed with cement. It weighed only 650 kg/m³ and had good acoustic and thermal properties (λ-value between 0.072 and 0.093 W/mK). Also other brands of lightweight concrete, including Argex, Durisol, Durox, Siporex, and Ytong, were used to make this type of slab, reinforced or not, for roofs, roof linings, and in some cases floors (see also chapter 1 on lightweight concrete). Beam-and-block systems consisted of beams, often with an inverted T-shape, in between which small, often hollow and lightweight blocks were placed. Their profile was designed in such a way that the blocks rested on the beams at their sides, yet creating a floor slab with a flat bottom surface. After the blocks were put in place, a layer of concrete was spread on top to make a monolithic floor. Each part of the floor fulfilled a specific function. The beams, which could be made in reinforced or pre-stressed concrete, as well as reinforced or pre-stressed ceramics, spanned the opening (up to approximately 6 m) and took up tensile forces. The cast in situ top layer, which was usually slightly reinforced, took up compression forces and connected all the separate elements in one monolithic whole. Structurally, the blocks usually had no or a limited loadbearing function: they filled in the space between the beams in the easiest and lightest way possible. One of the most important advantages of the beam-and-block floor system was that it consisted of small, prefabricated elements that could be handled without heavy machinery or mechanical equipment. There was no need for temporary supports or formwork, and the floors could be constructed relatively quickly (except for the top layer of concrete, which had to set). The blocks and beams were produced in various sizes, to suit different spans and loads. To simplify the variety of construction materials, in some cases the beams were designed to be also used as lintels above door and window openings. Beam-and-blocks systems can be classified according to the materials used to make the beams and the blocks. One type was a floor consisting of reinforced concrete beams and lightweight or hollow concrete blocks. These were produced by Betonal, Comptoir Central du Bims, and Argex among others. Betonal worked with reinforced concrete beams with an inverted T-shape, 13 cm wide and 11 cm high. Between the beams were long, hollow blocks, 49 cm wide (63 cm including the supports) and 11 cm high, with five internal cavities of 7 cm diameter. The joints between the blocks and beams were filled with concrete, and the top covered with a 3 or 4 cm compression layer. On the bottom of the floor, a metal mesh could be attached to facilitate the finishing of the ceiling. The floor was lightweight (40% lighter than a solid concrete floor slab), fire resistant, thermally and acoustically insulating, and quick to install. 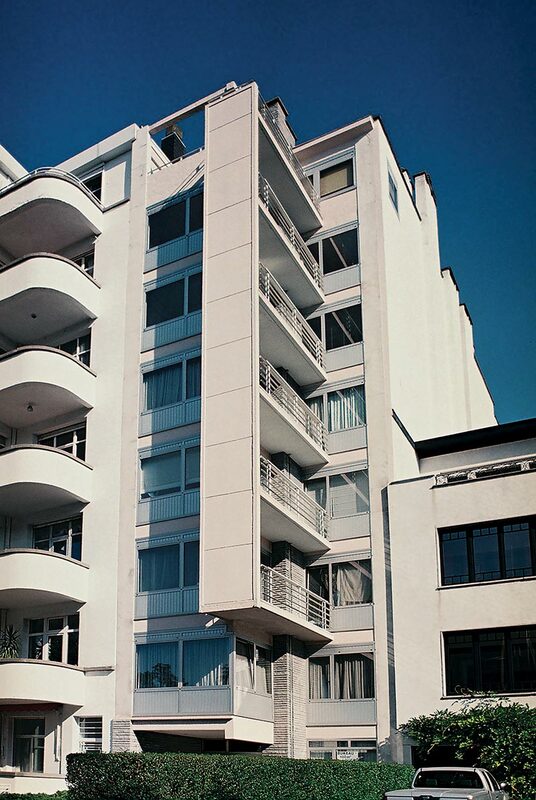 Developed in the 1940s, it was intended for residential buildings, and had a maximum span of 5.2 m and a working load of 200 kg/m² (although its strength could be increased, if necessary). 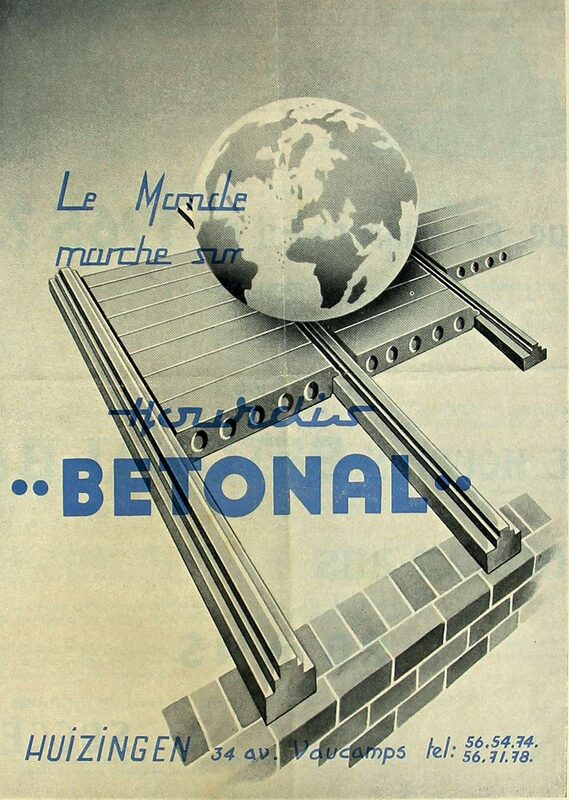 Unlike the blocks by Betonal, which were more or less rectangular, with flat bottom and top surfaces, those made by Comptoir Central du Bims and Argex were higher in the middle than on the side. They were also hollow except for a stiffening rib in the middle. The blocks by Comptoir Central du Bims (in pumecrete) were 46 cm wide and 25 cm high, while the reinforced-concrete beams were 16 cm wide and 24 cm high. The beam-and-block system by Argex, developed in the 1960s, used blocks made of lightweight concrete based on Argex granules of expanded clay, which reduced the dead weight of the floor even further (up to 50% compared to solid concrete floors) and enhanced its thermal insulating properties. The blocks were 13, 20, or 26 cm high, depending on the intended load and span of the floor. The beams for the Argex floor system had a rectangular concrete base and a special type of reinforcement bar, called Katzenberger, which protruded and was enclosed in concrete when the compression layer was poured. The bottom of the beam was finished with a small layer of Argex lightweight concrete, which increased the adherence for the ceiling finish. As it was the same material as the blocks, it created one homogeneous ceiling surface. If the loadbearing capacity of the floor needed to be increased, small ribs could be created transversely: some blocks were replaced with thin transverse concrete beams, on top of which reinforcement bars were placed. The final step was to cover the assemblage with a compression layer of concrete, connecting everything together. By replacing beams made of reinforced concrete with pre-stressed concrete beams, the loadbearing capacity of these floors could be increased. The construction company Van Thuyne produced such a system, called Flexicor. It contained inverted T-beams made of pre-stressed concrete, and hollow blocks with an irregular cross section, of lightweight concrete. Flexicor beams were 11 cm wide and 10 cm, 12.5 cm, or 17.5 cm high. The blocks were 35 cm wide and came in seven different heights, from 12.5 cm to 34 cm high. With the layer of cast in situ concrete on top, the floor’s total depth was between 13.5 and 37 cm. Such floors could carry service loads between 200 and 500 kg/m², for maximum spans of 9.65 m.
Another system with beams in pre-stressed concrete was produced by Novobric. Their floor system PL46 combined hollow ceramic blocks with precast beams made of pre-stressed concrete. The beams were approximately 10 cm high and 12 cm wide, with five reinforcement bars. The blocks were 32 cm wide and made in three different heights (10.5 cm, 12.5 cm, or 16.5 cm). For deeper floors, blocks could be stacked on top of each other (to heights of 21, 23, 25, 27, or 33 cm). And to increase the floor’s loadbearing capacity, the number of pre-stressed concrete beams could be doubled or, in other words, every other row of ceramic blocks could be eliminated. Concrete was poured between beams and blocks, and on top of the blocks, which could be either 1 cm thick or 3 cm thick, giving a total floor depth of 11.5 to 36 cm. The thinnest floor could span a distance of between 2 m (for 1000 kg/m²) and 4.55 m (for 150 kg/m²), while the span of the thickest reinforced floor was between 6.75 m (1000 kg/m²) and 10.25 m (150 kg/m²). Another Novobric product was the Listex floor system: this was an example of a beam-and-block system with ceramic beams. Similar to Novobric’s Atlas hollow core slabs, the beams were composed of relatively small elements that were connected with reinforced concrete or pre-stressed concrete. Listex beams were composed of a sort of empty trays in ceramics, shaped like an inverted T, 13 cm wide and 10.5 cm high. These trays had two grooves on the side and one on top, which were filled with reinforced or pre-stressed concrete to join them into one long beam. The joining could be done in situ, or elsewhere at the building site. The beams supported hollow ceramic blocks similar to those of the PL46 floor system (32 cm wide and 10.5 cm, 12.5 cm, 16.5 cm, or 10.5 + 10.5 cm high). The joints between blocks and beams were filled with concrete; for optimum performance, a compression layer of 1.5 cm or 3 cm of concrete was poured on top. The maximum span varied between 1.75 m (blocks of 10.5 cm, without a screed floor, with a maximum service load of 1000 kg/m²) and 8.55 m (two blocks of 10.5 cm plus a screed floor of 3 cm, with a maximum service load of 250 kg/m²). 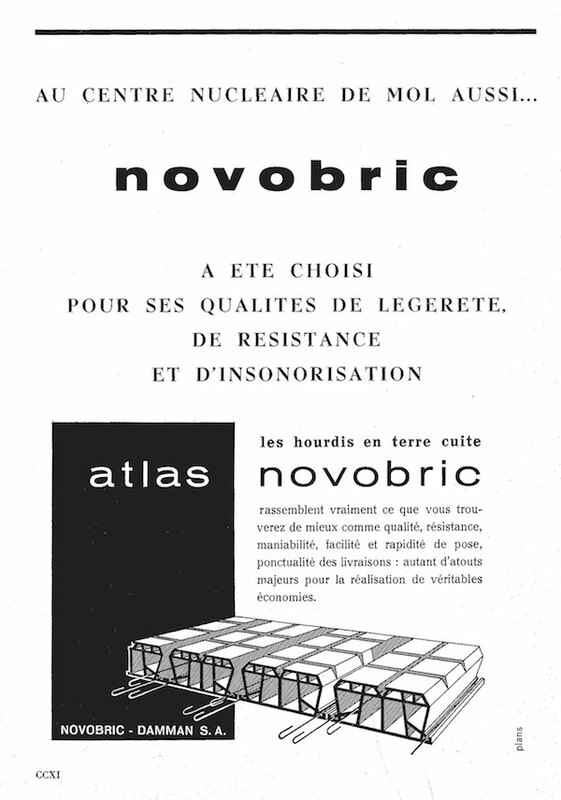 As an alternative to using reinforced concrete to connect the ceramic Listex beams, Novobric offered the option to use pre-stressed concrete. Also Steenbakkerijen van Ploegsteert and Comptoir Tuiller de Courtrai CTC developed floor systems with beams in pre-stressed concrete and ceramic. The latter produced the Rector floor system. This consisted of an inverted T-beam in pre-stressed concrete and ceramic blocks. Various sizes of beams and blocks were manufactured. The three types of beams were Rector 80 (8.5 cm high, 10 cm wide, containing two pre-stressing wires and weighing 14 kg per running meter), Rector 110 (11.5 cm high, 10 cm wide, with three wires and weighing 17 kg/m), and Rector 140 (14.5 cm high, 12 cm wide, five wires, and 27 kg/m). Five different blocks were developed, all hollow with internal stiffeners, and between 10 and 20 cm high and 30 and 40 cm wide. The beams and blocks could be combined in various ways, depending on the desired span and service load; if necessary, the number of beams could be doubled to increase the loadbearing capacity. The bottom of the beams was made of ribbed ceramics to improve the adherence of the ceiling finish. The whole was covered with a concrete compression layer. 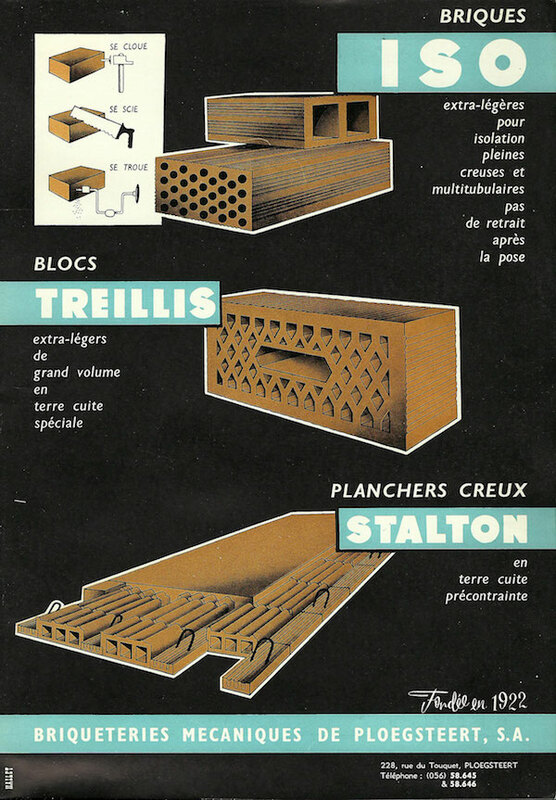 The Swiss block-and-beam system Stalhton was invented and patented by three engineers – M. R. Roš, A. Brandestini, and M. Birkenmaier – and in 1945, it began to be marketed by the Swiss company with the same name. The system was used in many countries, also in Belgium, where it was sold by Steenbakkerijen van Ploegsteert from the early 1950s on. The Stahlton beam consisted of short, hollow trays in ceramics with internal stiffeners, which were filled and connected with concrete and pre-stressing wires, to create one monolithic element. These beams could be used as such, e.g. as lintels or beams, or together with ceramic blocks and a compression layer to create a beam-and-block floor. As hollow core slabs and other prefabricated floor systems could be integrated easily into contemporary designs and construction, they became one of the most widespread construction elements in the post-World War II period. Like lightweight concrete and other ‘improved traditional’ building materials, prefabricated floor systems were readily incorporated into Belgian building practice thanks to their practical, technical, and economic advantages (cheap, easy to handle, and quick to construct, and thermal and acoustical insulating properties), without any negative implications for design. 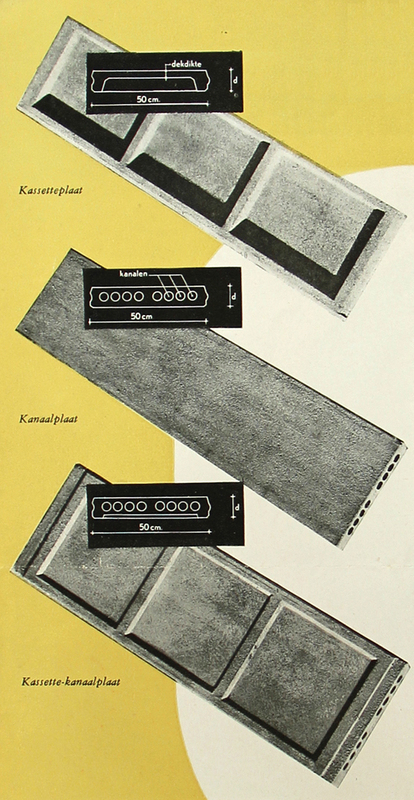 The rapid rise of hollow core slabs in the post-war period is illustrated by the differences in the catalogues of the Etablissements Victor Trief, a building materials trader: the 1948 edition did not mention hollow core slabs, while the 1950 edition included hollow core slabs in different sizes (7.5 to 15.5 cm high, 2.50 to 6.70 m long, service loads between 150 and 500 kg/m²), and the 1952 edition contained not only tables but also drawings of the various types. During the 1950s and 1960s, almost every prefabrication company and concrete contractor produced one or more types of hollow core slabs. This can be seen in a table that lists producers of lightweight concrete products in Belgium, published in the architectural journal Neuf in May-June 1972 (see also chapter 1 on lightweight concrete). The table listed 15 manufacturers of prefabricated floors made of lightweight concrete. And although the table did not include all manufacturers, but only those using particular types of lightweight concrete and companies associated with the Union des Agglomérés de Ciment de Belgique (UACB), still it mentioned 11 companies producing precast floors that have not been discussed in this chapter, i.e. Gebroeders Bastijns, Bauwens-De Cap, Decovlam, Depauw, G. De Rijcke, P. Maessem, Omnia Limburg, J. Remacle, Usines Dauchot, G. Vandewalle, and Warnant. Thus an enormous variety of prefab floor systems and products was available in Belgium during the post-war period. These were quite diverse with respect to materials, dimensions, weight, and loadbearing capacity. Therefore, many manufacturers published brochures that gave an overview of the available products in different dimensions, including the maximum service loads (usually between 200 and 500 kg/m²) for maximum spans. 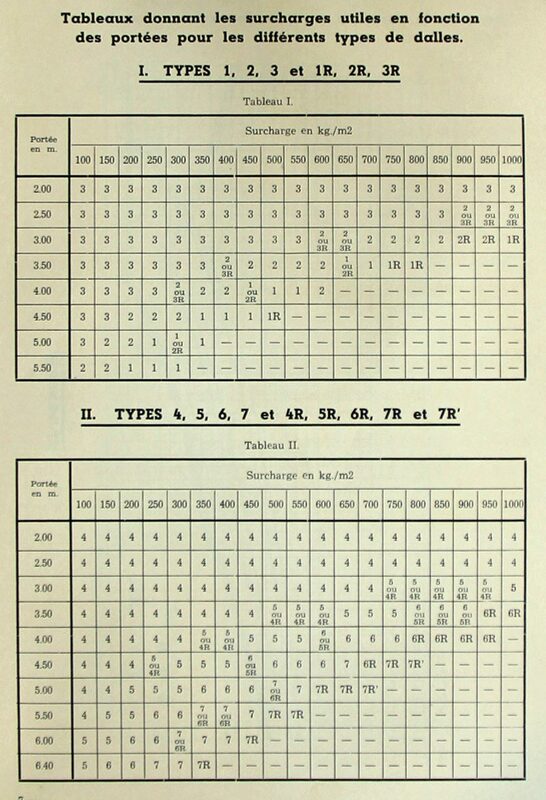 The content of such catalogues was very alike, with similar sales arguments, drawings, and tables and graphs showing the relationship between span and load. They were drafted in such a way that an architect could easily use them to choose an appropriate product, without the help of an engineer. The choice of a prefab concrete floor thus became a merely practical topic, not an issue that was subjected to debate or discussion. 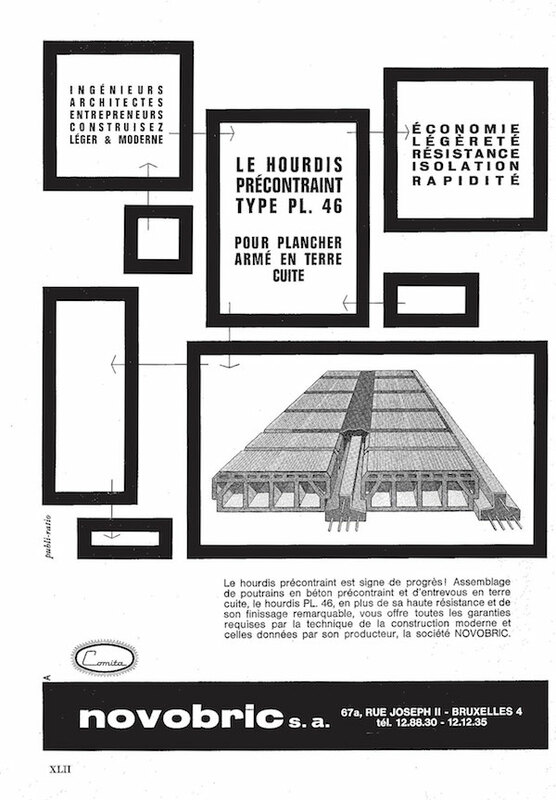 Considering houses built in the Brussels Capital Region published in architecture journals between 1945 and 1975, and specifically those for which construction techniques were described, approximately 30% of them contained prefabricated floor systems. Unfortunately, the floor manufacturer was hardly ever explicitly mentioned by name. Apart from the rare references to B.A.S.C., Novobric, and Monotub, almost every article described the floor system in very general terms, as if the use of precast floor elements was so common and familiar that there was no need to go into detail. Usually floors were simply referred to as hollow core slabs, sometimes with extra adjectives (prefabricated, tubular, or insulating). A few times the material of the floor was mentioned (mainly concrete or reinforced concrete, occasionally terracotta or autoclaved gas concrete). Once constructed and finished – usually with a layer of plaster covering the bottom and wooden flooring or tiles on top – the difference between one and another was hardly visible. Looking at the company catalogues and commercial brochures to see how and where precast floor systems were used in postwar housing in Brussels, some specifically referred to applications in Brussels, but did not provide much detail. Vibrabeton, for instance, included many examples where their hollow core slabs Ultra had been used, e.g. 296 apartments in the social housing complex Le Home at the Chaussée Romaine in Brussels, as well as in apartment buildings in Brussels, Molenbeek, Uccle, Anderlecht, and Auderghem. Yet Vibrabeton did not include any construction details for these applications. One company in particular seemed to focus very much on the Brussels market: B.A.S.C. In a commercial brochure dating from the end of the 1940s or the beginning of the 1950s, it listed numerous projects, especially in Brussels, and referred to more than 80.000 m² of B.A.S.C. floors used in apartment buildings, of which over 90% were located in Brussels (including 50 apartment buildings in Brussels, Woluwe-Saint-Lambert, Ixelles, Uccle, Anderlecht, Etterbeek, Molenbeek, Schaerbeek, Forest, Ganshoren, Laeken, and Saint-Gilles). The most famous project (and also one of the largest, with 9.000 m² of B.A.S.C. floors) are probably the apartment buildings Leopold and Albert in the Leopold district, by architects Jean-Jules Eggericx and Raphaël Verwilghen, built just before and right after the Second World War (1935-1951). Go to the image archive or Read "window frames"